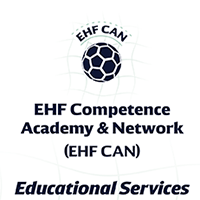 "The EHF CAN educational services are both essential and undamental to those playing, coaching and offciating handball. If one’s particular competence is not recognised and not kept up to date, it causes a major handicap. The EHF wants champions whose individual and intellectual development will be all the better for both their sport and occupational career."